Public transportation is a far more efficient mode of personal transport than a private vehicle. Benefits to the environment include less pollution and energy use and less need to occupy and pave land for roading and parking spaces. Unfortunately, public transport use in New Zealand is low. 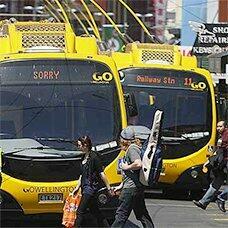 Only 2.2 percent of all trips are made by bus, and 0.25% by rail, mostly in Wellington. Ferries also operate in the Auckland and Wellington areas. Public transport is more likely to be used if the services are frequent and reliable; if it is convenient, comfortable and safe; and the time it takes to arrive at the destination is comparable to using a private vehicle. The CO2 emitted from the fuel burned in the engines of aircraft contributes to climate change. The Stern Review reported that air travel accounts for about 1.6% of total global CO2 emissions. However, aviation is the fastest growing form of transportation and its growth is threatening progress to reduce emissions in other areas. A tripling of air travel is expected over the next four decades contributing to 2.5% of total emissions. Although this seems a comparatively small figure, the actual impact of these emissions is much greater than expected. This is because greenhouse gases are more potent when released at altitude – it is thought they may have twice the warming effect of emissions at lower altitude because greenhouse gases at high levels absorb and retain heat more effectively than at lower altitudes. Furthermore, the water vapour and particles that are also spewed from aircraft engines create contrails at high altitudes. Contrails will often spread out and freeze to form large cirrus clouds that also help prevent the earth’s heat from escaping into space. The warming effect of contrail clouds appears to be further enhanced at night. Thus, by 2050 aviation could account for 5% of human induced climate change. What can we do to reduce the effects on climate change of air travel? Aircraft technology is constantly improving and the next generation of long-haul jets such as Boeing 787s will be 40-50% more fuel efficient than current aircraft. However, with air travel growing so quickly, behavioural changes are also required. One thing we can do is try to fly less for business and tourism reasons and when we do fly for pleasure, stay longer. The other step we can take is to offset our air travel. This involves paying a little extra money each time you travel to an offsetting organisation that invests your money in a project that absorbs a matching amount of CO2. This can be done in various ways such as planting new forests or investing in renewable energy projects that displace the use of fossil fuels. While air travel has received considerable attention lately for its contribution to GHG emissions, shipping has generally been considered a green transport option and has escaped much attention. Although it is true that shipping, on a per kilogram basis, is a much more efficient mode of transporting goods than airplanes, new studies are showing that CO2 emissions from shipping are significantly higher than previously thought. This is due to the sheer size of the global fleet and rapidly expanding international trade, which has doubled in the last 25 years. There are about 70,000 ships plying the world’s oceans. They consume about 200 million tonnes of fuel per year and emit between 600 and 800 million tonnes of CO2, about 5% of the global total. What is even more worrisome is that about 20,000 new ships are on order and they are generally bigger than existing ones so CO2 emissions from shipping will increase greatly over the next 15 years, perhaps by as much as 75%. At this time, GHG emissions from ships do not come under the Kyoto protocol. So what’s the solution? Its unlikely that world trade is going to slow much in the foreseeable future and ships are still the most efficient way of transporting goods. What we need is a fleet of much more efficient vessels and some companies are certainly thinking along those lines. New standards for ships and innovative technologies are required.